Where Jurassic Park went wrong! 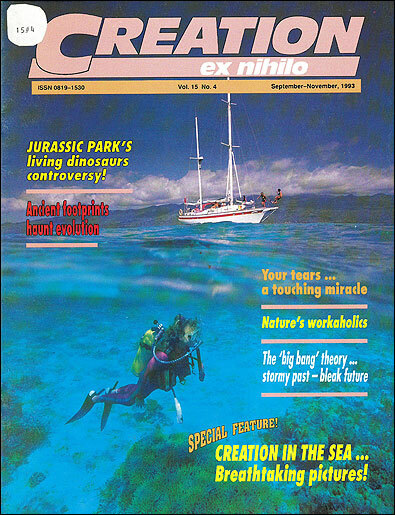 While movie mogul Steven Spielberg prepared for the premiere of his US$50 million blockbuster dinosaur film Jurassic Park in early 1993, equally spectacular dinosaur-type news was flowing in from around the world. Whether it’s Spielberg or stegodons, ‘Nessie’ or ‘Caddy’—dinosaurs and such creatures are on news reports and in conversations everywhere. And because most people have heard only the evolutionary viewpoint about these creatures, it is important that Christians know how to respond to the evolutionary comments. Take Jurassic Park for instance. The plot revolves around a quirky billionaire who sets out to recreate dinosaurs from DNA extracted from a blood-sucking insect which had dined on dinosaur and had then been trapped in amber (fossilized tree resin). Dinosaurs are then genetically recreated for the tycoon’s dinosaur theme park. But the dinosaurs break out of control, escape from the park, and start feasting on passing vehicles. People around the world have been asking if scientists could really resurrect these robust reptiles from DNA extracted from a preserved insect allegedly more than 100 million years old. About four million fragments would have to be linked in the correct order—without knowing what that order was! So, despite what you hear about multi-million-year-old insects being found, DNA in them means the insect can be only thousands of years old at most. And how to bring the creature back to life is something science today has no idea how to do—a fact overlooked in Jurassic Park. But could real dinosaurs be living today? What about all the reported sightings? If dinosaurs died out more than 60 million years ago, as evolutionists propose, then there can’t be any convincing evidence for their living today, or even in recent times. Bones, of course, don’t stay fresh very long—certainly not for millions of years. These discoveries clearly indicate that dinosaurs were around recently. It is possible too that some of those huge flying reptiles, the pterosaurs, also survived Noah’s Flood and lived into recent times. The Illustrated London News of February 9, 1856 (p. 166) reported that workmen digging a railway tunnel in France last century disturbed a huge winged creature at Culmont, in Haute Marne, while blasting rock for the tunnel. The creature was described as livid black, with a long neck and sharp teeth. It looked like a bat, and its skin was thick and oily. It died soon after. Its wingspan was measured at 3.22 metres (10 feet 7 inches). A naturalist ‘immediately recognised it as belonging to the genus Pterodactylus anas’, and it matched the remains of known pterodactyl fossils. American Indians have stories of creatures they call ‘thunderbirds’, the description of which resembles that of a pterosaur. It is possible that the reason they can describe and draw these creatures is because their ancestors saw them. Less conclusive perhaps, but not necessarily to be dismissed, are modern claims of sightings of dinosaur-type creatures. Yet even among these there seem to be credible witnesses. Some scientific attempts to verify the existence of dinosaurs today have centred around the remote jungles of the Republic of the Congo, in central western Africa. Several scientific expeditions have taken place there, with the help and sponsorship of the Congolese Government, in an effort to verify reports of previously unidentified animals. One of these animals, known to the local natives as Mokele-mbembe, fits the description of a small plant-eating dinosaur. Mackal says that a giant turtle and a monkey-eating bird have been identified with some certainty as living in the Likouala swamps. An unknown species of large crocodile also seems to inhabit the area. If this is where things were left, there would be general agreement that these are exciting discoveries for science, and that more research would be worthwhile. But Dr Mackal also reports sightings of other unidentified creatures, including Mokele-mbembe, which he is fairly convinced is a small sauropod dinosaur. Biologist Marcellin Agnagna is another trained scientist who officially reported seeing Mokele-mbembe. He said that on May 1, 1983, he and members of his party came across a Mokele-mbembe in the Congo’s remote Lake Tele.12 It had a wide back, a long neck, and a small head. The front of it was brown, and its back appeared black. It was in the shallow water of the lake, and the length visible above the waterline was about five metres (16 feet). It is therefore possible that at least one type of dinosaur may be living today. If it is indisputably accepted after further investigation, it would not be the first time that creatures which evolutionists had thought had died out millions of years ago have actually been found alive. But it is important to distinguish between fantasy, feasibility, and fact. Jurassic Park, though seemingly based on high-tech real science, is fantasy. Tests show that DNA would not last much more than 10,000 years, certainly not millions; reconstructing the genetic blueprint of such long-gone creatures is overwhelmingly complex and is probably impossible; and getting life back into those molecules or cells is something which science today has no idea how to do. The feasibility of the idea that some dinosaurs may still be alive has a little more support, although at this time we would have to say it is not conclusive. The fact, however, is that creationists are in a better position than evolutionists on these matters. Whether you consider the DNA aspect or the fresh dinosaur bones aspect, the evolutionary idea of millions of years does not look credible. And when you consider the complexity involved in the genetic code—and that the fossil record shows no dinosaur evolution—the God-honouring conviction that dinosaurs and all other life came about through supernatural creation looks very convincing indeed. 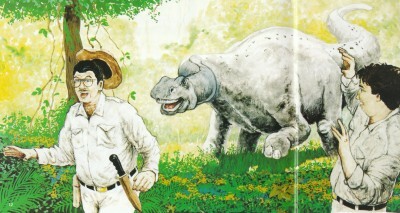 Lai Kuan and Jian Qun, ‘Dinosaurs: Alive and Well and Living in Northwest China?’, China Today XLII(2):59, February 1993. The Weekend Australian, 26–27 June 1993, p. 15; Radio National (Australia) 8 am news report, 25 June 1993. ‘Is Caddy a mammal?’ Science Frontiers, May–June 1993, p. 2; Penny Park, ‘Beast from the Deep Puzzles Zoologists’, New Scientist, 23 January 1993, p. 16. ‘Reassessing the marvellous mammoths’, The Age (Melbourne), 29 March 1993. ‘The elephant that time forgot’, The Mail on Sunday, 23 May 1993. ‘Film sparks dinosaur debate’, The Courier-Mail, 10 June 1993, p.10; Virginia Morell, ‘Dino DNA: The Hunt and the Hype’, Science 261:161, 9 July 1993. Bryan Sykes, Nature 352:381, 1 August 1991. For more information, see Carl Wieland, ‘DNA dating: Fascinating evidence that the fossils are young’, Creation 14(3):43, June–August 1992, p. 43. Nigel Hawkes, ‘Could it Happen?’, The Australian Magazine, 24–25 July 1993, p. 16. Margaret Helder, ‘Fresh dinosaur bones found’, Creation 14(3):16, June–August 1992. Ibid. This discovery was reported in 1985 in Geological Society of America abstract proceedings, Vol. 17, p. 548. Also in an article by Kyle L. Davies, ‘Duckbill Dinosaurs (Hadrosauridae, Ornithischia) from the North Slope of Alaska’, Journal of Paleontology 61(1):198–200. Roy P. Mackal, A Living Dinosaur? In Search of Mokele-Mbembe, E.J. Brill, Leiden, The Netherlands, 1987.